Instructors striving to facilitate the building of community in online courses must make evidence-based decisions in choosing the most effective interaction types during the course-design process. The study reported in this paper sought to identify which types of interaction contribute most to students' sense of community (SoC) in online graduate courses at a regional comprehensive university. 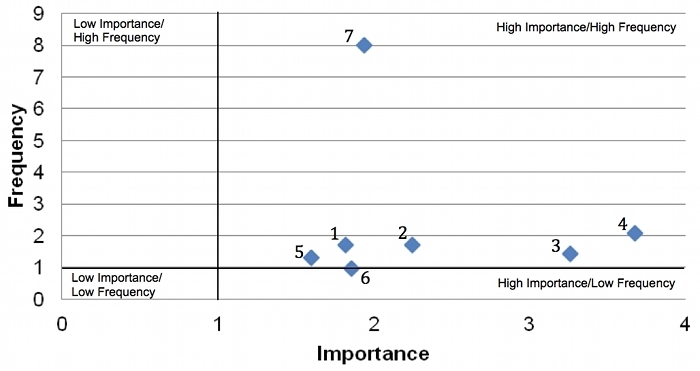 Rovai's Classroom Community Scale was used to measure SoC, and Likert-scale questions were employed to measure frequency and perceived importance of seven kinds of learner–instructor interaction. The results indicate that the interactions that are most predictive of SoC include instructor modeling, support and encouragement, facilitating discussions, multiple communication modes, and required participation. Instructor modeling was found to offer the greatest yield to instructors as a balance between effort and benefit. Implications for online course design are discussed. While not a new concept, distance education has flourished with the expansion and rapid speed of the Internet. There are 6.7 million students enrolled in at least one online course, accounting for 32% of all student enrollments in higher education courses in the United States (Allen & Seaman, 2013). Development of community is an important factor in determining student satisfaction with online learning (Liu, Magjuka, Bonk, & Lee, 2007; Ouzts, 2006; Rovai, 2002a). As instructors design online courses they need empirical evidence that supports which course activities enhance learner-to-instructor interaction and which have the biggest impact on the creation of community. The purpose of the study reported in the present paper is to quantitatively examine which types of learner–instructor interactions contribute most to the development of students' sense of community (SoC) in online learning. McMillan and Chavis (1986) define community as "a feeling that members have of belonging, a feeling that members matter to one another and to the group, and a shared faith that members' needs will be met through their commitment to be together" (p. 9). Interaction is considered to be "reciprocal events that require at least two objects and two actions" (Wagner, 1994, p. 8). In learner–instructor interaction, the instructor attempts to stimulate student interest in the course content, to motivate the student, and to facilitate the learning process (Swan, 2003). An analysis of the contribution of learner–learner interaction (Moore, 1989) to students' SoC is reported elsewhere (Shackelford & Maxwell, 2012); while other types of interaction such as learner–content (Moore, 1989) and learner–interface (Hillman, Willis, & Gunawardena, 1994) may also contribute to the development of online classroom community, they do not fall within the scope of the present study. Two decades of research in the area of online learning and community have provided support for a number of important ideas. Studies have demonstrated that it is possible to create an environment that facilitates the development of community in an online classroom setting (Rovai, 2001). Furthermore, it has been shown that instructors can enhance online community by purposefully designing courses to minimize student isolation (McInnerney & Roberts, 2004; Yang & Liu, 2008). Despite the difficulties inherent in building a learning community in an online environment (Brown, 2001; Vesely, Bloom, & Sherlock, 2007), studies support the value of building community for social reinforcement (Conrad, 2005; Gallagher-LePak, Reilly, & Killion, 2009; Moller, 1998), information exchange (Moller, 1998), and student outcomes (Anderson, 2008; Drouin, 2008; Exter, Korkmaz, Harlin, & Bichelmeyer, 2009; Liu et al., 2007; Shea, 2006; Shea, Li, & Pickett, 2006; Tinto, 1975; Wegerif, 1998). There is much evidence to support the assertion that SoC can be developed in an online learning environment through promoting interaction (O'Hara, 2008; Palloff & Pratt, 1999; Stepich & Ertmer, 2003). Interaction in online courses has been found to be positively correlated with students' SoC (Baab, 2004; Lear, 2007). Dawson (2006) found that interaction explains a significant proportion of variance in community developed by online students. Vygotsky (1978) views learning as a process in which a learner works to construct new meaning through active involvement. He emphasizes the critical importance of culture and the importance of the social context for cognitive development; hence the term "social constructivism." The purpose of education from the social constructivist point of view is to enable learners to construct knowledge together. Ideally, the instructor establishes an environment in which active participation and conversation can occur, and the learner participates in learning by engaging in interaction with his or her instructor, peers, and content. The lecture approach found in some forms of distance education does not contribute to active student learning. Most students benefit from a two-way flow of information and from the mediation of an instructor as they attempt to make sense of complex content (Wallace, 2003). Interaction between the learner and instructor, as well as between the learner and other learners, is important to support the construction of knowledge (Rovai, 2004). In an online education setting, instructors must carefully plan for the flow of information by using technology, equipment, and asynchronous activities to enhance learning. The communication and exchange of information needed to support construction of knowledge over a distance are primary considerations for activities and technologies utilized by the instructor (Vrasidas, 2000). While it is recognized that several types of interaction may contribute to SoC, the scope of the analysis in the present paper is limited to interactions taking place between the learner and the instructor. As stated earlier, the results of an analysis pertaining to learner–learner interactions are published in another paper (Shackelford & Maxwell, 2012). Providing information on goals, expectations, and ethics. A number of researchers point to the importance of the instructor establishing standards by which an online course will be conducted (Baab, 2004; Gallagher-Lepak et al., 2009; Haythornthwaite, Kazmer, Robins, & Shoemaker, 2006; Rovai, 2002a, 2004; Shea et al., 2006; Ritter, Polnick, Fink, & Oescher, 2010). In Gallagher-Lepak et al. 's qualitative study, students indicated an appreciation for clear guidelines for communication requirements. In a multi-site study of over 1,000 students, Shea et al. found that effective instructional design and organization were positively correlated with SoC. Design and organization include communication of expectations, course goals, topics, and participation guidelines. In similar fashion, students who exhibited a strong SoC in an online course reported an understanding of established norms of the group as well as conflict resolution processes in Baab's mixed-methods study of 161 students. In Lear, Ansorge, and Steckelberg's (2010) mixed-methods study, students revealed that their SoC was related to the instructor leading and guiding class discussions. Participating in and guiding discussions. The importance of the instructor's role as discussion facilitator or guide is well documented in the literature (McElrath & McDowell, 2008; McIsaac, Blocher, Mahes, & Vrasidas, 1999; Rovai, 2002a, 2004). Students in a mixed-methods study by McIsaac et al. felt that instructor participation in their online academic discussions gave credibility to their discussions. They believed that the instructor, as a content expert, offered a valuable presence, and therefore requested that the instructor be part of the discussions. Distance students in a graduate course valued two-way synchronous communication because it enabled them to ask questions of the instructor and receive responses to their questions during discussions (Rogers, Graham, Rasmussen, Campbell, & Ure, 2003). McIsaac et al. suggested this participation should be facilitative rather than authoritarian. In Conrad's (2005) multi-year qualitative study of graduate-level online students, effective instructors were described as able to facilitate discussion and engage meaningfully in both academic and social discussions. The students in Lear's (2007) mixed-methods study reported that the interactions that lead to development of SoC were instructor driven. They added that ongoing instructor responses were important in building on early community development activities as the semester progressed. Liu et al. (2007) found a positive relationship between SoC in online graduate students and instructor presence and facilitation of discussion. A strong instructor presence that included active guiding of discourse was associated with high SoC in Shea's (2006) study involving over 2,000 online learners from 32 colleges. Providing support and encouragement. Online community will not thrive unless the instructor provides support and encouragement to students (Rovai, 2002a). In a qualitative study of the social dimension of an online course, Wegerif (1998) found that it was important to provide structure and support in the form of scaffolding at the beginning of a course as students learned complex skills. Over the duration of the course this support can be gradually reduced as students become more secure in their roles as learners and class members. Similarly, Brown (2001) found that support from the online instructor was critical at the early stages of the semester as students dealt simultaneously with new content, new technology, and a novel learning environment. Rogers et al. (2003) found that instructors of a graduate course felt distance students benefited from one-on-one interaction over the phone to supplement e-mail communication and interaction within the course. The extra communication encouraged interaction in the course and helped the students feel a greater sense of belonging and connection to the class. Providing timely feedback. Graduate students in a qualitative study by Vrasidas and McIsaac (1999) reported that they found the lack of prompt feedback to posted essays and discussion postings discouraging, and that this lack of feedback led them to participate less in the online discussions. Lear's (2007) mixed-methods study found a significant correlation between online student SoC and the interactivity element "evidence of instructor engagement" – this element comprises timeliness and quality (level of analysis, suggestions for improvement) of instructor feedback. Similarly, McIsaac et al. (1999) heard from students that promptness and content of feedback was very important in maintaining community. Participants indicated that they required immediate and frequent feedback on their work, feedback on their overall progress, and personalized and group feedback. They felt isolated and unsatisfied when feedback was not immediate. Liu et al. 's (2007) mixed-methods study found a positive relationship between SoC in online graduate students and instructor presence and facilitation. Two of the three survey items measuring instructor presence dealt with feedback. One question addressed regularity of feedback and the other addressed informativeness of feedback. Conrad's (2005) multi-year qualitative study of community in online learning revealed that graduate student participants had a great deal to say about instructor feedback. They defined effective instructors as present, prompt, and responsive. They reported that "absentee instructors" (p. 12) who did not create a SoC had a negative effect on the sense of purpose and motivation of the students in the course. Using multiple modes of communication. In interviews conducted over the course of a year, students in online courses indicated the importance of having multiple ways to communicate in order to sustain interaction (Haythornthwaite et al., 2006). They voiced appreciation for public, private, synchronous, asynchronous, electronic, and face-to-face communication. Rogers et al. (2003) found in their case study that distance students valued multiple ways to interact, including synchronous class meetings, asynchronous communication, and phone contact with the instructor. Instructor modeling. The demonstration of effective teaching interactions is an important role of the educator (Berge, 1995). Brown (2001) found that instructor modeling was one type of interaction that helped develop community in an online course. Experienced online students also modeled expected communication behaviors early in the semester. Tu and McIsaac (2002) found that instructors were able to enhance interaction in an online class of 51 graduate students by employing communication strategies such as initiating conversation, using praise, and using an inviting tone of voice in their written responses. In Vesely et al. 's (2007) qualitative study examining SoC in 48 graduate students, student participants ranked instructor modeling as most important in developing community. Required participation. Pate, Smaldino, Mayall, and Luetkehans (2009) examined the relative importance of required academic participation and optional academic and social participation in an online graduate class. They found that students responded to the required participation with frequent and meaningful responses but posted less frequently to the optional forums. They concluded that SoC can result from social interaction that is built into required academic interaction. Gallagher-Lepak et al. (2009) reported that students indicated that required participation in their online class was important in the process of building SoC. In their case study, Stepich and Ertmer (2003) reported that students must participate in an online class at a minimum level in order to be successful. They recommended that students be provided with ongoing participation scores and that the instructor help them understand the ways in which their participation allows and supports the collaborative learning that takes place in the class. A cautionary note was sounded by Gulati (2008), who suggests that required participation limits student autonomy. Diverse ways of learning might be violated by a highly structured environment, and Gulati recommends awareness of this important element. What learner–instructor interactions in online learning are most predictive of SoC? This study made use of a non-experimental quantitative descriptive design. During the Fall 2011 semester, 150 faculty members teaching online graduate courses at a regional comprehensive university in the South Central United States were contacted for permission to survey their students. A wide range of academic disciplines was represented. The 110 faculty members who granted permission to survey their students provided access to 1,589 unique students. Multiple online courses per student resulted in 2,189 enrollments in total. Selection criteria for students were being an age of 18 years or older and being enrolled in at least one graduate-level online course during the Fall 2011 semester. The principal investigator sent surveys to the 1,589 students via e-mail. After two follow-up e-mail reminders were sent, 381 usable surveys were returned, for a response rate of 24%. Twenty-eight incomplete surveys were not included in the analyses due to insufficient data. Descriptive statistics were calculated to describe the study sample and population (see Table 1). aExperience with online learning is measured as number of previous online courses. bThe population is all students taking online graduate courses during the Fall 2011 semester at the University. Student SoC was measured using the Classroom Community Scale (CCS – Rovai, 2002b). This scale, consisting of 20 Likert-type items, reflects connectedness and perceived learning. Face validity and construct validity have been established for the postsecondary population (Rovai, 2002b; Rovai & Baker, 2005); internal consistency of the scale items of the CCS has also been established for a number of university populations. Reliability for this instrument is strong, as evidenced by excellent Cronbach coefficient alphas and split-half coefficients in several studies (Dawson, 2006; Ritter et al., 2010; Rovai & Baker, 2005; Shea et. al, 2006). Interaction type and frequency were measured using a 32-item Qualtrics survey developed by the authors (see Appendix A, which also includes the demographic questions asked of participants). As described earlier, seven learner–instructor interactions that had two or more research studies supporting their contribution to SoC were identified through an extensive review of the literature. The authors formulated survey questions to elicit the students’ perceptions of the frequency with which each interaction occurred in their course and the importance of that interaction to their development of community. A panel of experts and a focus group reviewed the survey to determine face and content validity. Reliability analysis was conducted to determine internal consistency of the interaction scale. SoC was operationalized as the overall CCS score (Rovai, 2002b). Frequency of learner–instructor interaction was operationalized as participant scores on a 5-point Likert scale, with responses ranging from 1 (Never) to 5 (Very Often). Importance was measured by participant scores on a 5-point Likert scale, with responses ranging from 1 (Not at All) to 5 (Very). Statistical Package for the Social Sciences (SPSS) version 19.0 was used to perform the data analysis. CCS Total Score was entered into SPSS as the dependent variable, and interaction items were entered as the independent variables. Negatively worded CCS items were reverse coded so that a high score consistently denoted a high level of community for all items. The CCS Total Score was obtained by totaling the CCS responses for each participant. Multicollinearity diagnostics were conducted, followed by stepwise linear regression analysis, to investigate the amount of variance explained by each type of learner–instructor interaction. Demographic variables were entered into the regression model to determine their effect on SoC. Additionally, results were interpreted using a matrix to identify low-frequency, high-importance and high-frequency, high-importance interaction items. These categories of interaction were expected to offer the most yield to an instructor in online course design in terms of balance between instructor effort and student benefit. Chi-squared analyses were conducted to examine the relationship between the frequency and importance of each interaction. Responses were recoded to collapse data into three categories for each variable due to low cell counts. Ratios of importance to frequency were calculated using frequency data from the chi-squared analyses. This placed each type of interaction in a quadrant of an importance-to-frequency scatterplot, with each interaction representing Low Importance/Low Frequency, Low Importance/High Frequency, High Importance/Low Frequency, or High Importance/High Frequency (see Figure 1). Low values were defined as less than 1.0, and high values were defined as more than or equal to 1.0. A reliability analysis revealed Cronbach's coefficient α of .928 for the CCS scale, indicating the scale has excellent reliability. Cronbach's coefficient α was .893 for the learner–instructor frequency items and .896 for the learner–instructor importance items, indicating good reliability. All interaction items were moderately associated with higher CCS Total Score with the exception of item 7 (required participation), which had a low association (see Table 2). Note. LIF = Learner–Instructor Frequency. Multicollinearity diagnostics indicated no cause for concern using a cutoff value of 5. No Variance Inflation Factor (VIF) values for independent variables or demographic variables exceeded 3.528. For learner–instructor interactions, the regression model is significant (F = 71.386, p < .05) with the adjusted R2 value indicating that about 48% of the variance is explained by Instructor Modeling, Support and Encouragement, Facilitating Discussions, Multiple Communication Modes, and Required Participation (see Table 3). Chi-squared results showed that for each type of learner–instructor interaction, frequency was significantly related to importance. For all types of interaction, the relationship was positive in direction. There were no Low Importance items, indicating that all learner–instructor interaction types were valued by students as important contributors to building SoC (see Figure 1). Item 6 (Instructor Modeling) was a High Importance/Low Frequency item, though the frequency was only marginally low. This indicates that instructor modeling is a high-yield interaction type for the instructor attempting to build community. Results of this study revealed that learner–instructor interactions are correlated with SoC and identified a number of interactions are contributive to SoC. The interactions between learner and instructor that were most contributive to SoC, in decreasing order of contribution, were: (1) instructor modeling; (2) support and encouragement; (3) facilitating discussions; (4) multiple communication modes; and (5) required participation. Instructor modeling, or the demonstration of expected communication behaviors by the instructor, emerged as highly contributive to SoC. Instructors have the ability to enhance positive interaction in their online courses by showing students how to engage in behaviors such as initiating conversation, accepting varied viewpoints, praising others' efforts, and inviting continued commentary (Tu & McIsaac, 2002). This important form of interaction is highly valued by students, but instructors may not be aware of the great potential of this interaction in forming community. As reported by Vesely et al. (2007), graduate students ranked instructor modeling as most important in developing community, while it was low on the instructors' lists. The emergence of support and encouragement as an important contributor is consistent with the literature in online learning. Students benefit from both structural support in the form of scaffolding (Wegerif, 1998) and emotional support (Rovai, 2002a) as they learn new skills. Novice students who are simultaneously managing new content, technology, and a new learning environment especially need support and encouragement from the instructor early in the semester (Brown, 2001). Students value an instructor who can support their learning by offering both content and technology expectations that increase in complexity at a reasonable pace. Once an instructor is comfortable with new distance learning technology, for example, that technology can become transparent; it is easy to forget that students need an opportunity to learn progressively. Students benefit from an instructor who keeps in mind that it is best to keep things simple early in the semester as everyone climbs the learning curve. The results of this study support the assertion of many authors that the instructor plays an important role in participating in and guiding student discussions. Regardless of the format, students value the guidance of the instructor during discussions. Students may feel more a part of a learning community when they know their contributions to a discussion are being reviewed and considered by the instructor. They benefit from knowing that the discussion is being nudged in a thoughtful and informed direction. Students discussing topics among themselves without instructor input may feel they are engaging in busy work that does not contribute to their learning. In the current academic environment in which students expect a tangible return on their investment in tuition costs, they are likely to value instructor guidance of discussions as evidence that they are not engaged in self-instruction. The finding that students value multiple communication modes between themselves and the instructor is in agreement with Haythornthwaite et al. (2006) and Rogers et al. (2003). The ability to communicate over distance using public, private, synchronous, asynchronous, electronic, and face-to-face communication helps the student feel connected and decreases a sense of isolation. This finding underscores the idea that some students want more than efficiency from their online learning experience. They value an opportunity to communicate with the instructor as a means of clarifying expectations, verifying that their ongoing work is proceeding in the right direction, and gaining feedback on the quality and accuracy of their work. The availability of multiple modes of communication also responds to the range of students' comfort with various forms of communication, and respects varied student schedules and time zones. While some students are comfortable with asynchronous electronic communication, some may experience anxiety if they are unable to engage in synchronous communication. A phone conversation or Skype session can enable students to gain a sense of connectedness to an instructor with whom they then are willing to engage in reciprocal effort. There is some discussion about the impact of required participation on student autonomy (Gulati, 2008), but this study underscores the importance of participation in building a cohesive group of students. It is likely that required participation leads to increased interaction, which in turn facilitates other interaction types. The act of requiring student interaction has been categorized in this study as a learner–instructor interaction, but depending on the nature of the requirement, there may be overlap in this area between the boundaries of various types of interaction. In practice, learner–instructor interaction and learner–learner interaction is often interdependent. The surprise result of this study is that timely feedback did not emerge as predictive of SoC as we would expect based on the work of numerous authors (Conrad, 2005; Lear, 2007; Liu et al., 2007; McIsaac et al., 1999; Vrasidas & McIsaac, 1999). It is possible that feedback, with its potential for being either negative or positive, may not always be perceived as building community. Its primary function may be more related to instructing and informing rather than building connectedness. Additionally, this study did not attempt to determine perception of the quality of feedback, which may be an important factor in its role in building SoC. Students' demographic characteristics contributed little to the development of SoC in this study. Experience with online learning was the only variable that emerged as a contributor to SoC. This finding is in accordance with results reported by Brown (2001), Gallagher-Lepak et al. (2009), Lear (2007), and Rovai (2001). Experienced distance learners tend to interact more and work toward building community more than novice online learners. It is possible that they engage in this behavior because they are not attempting to manage simultaneously the learning of new technology and new content. They may also place a high value on community, having learned through experience that making contacts will support their connectedness and learning. Age, gender, and employment status variables did not contribute to SoC in this study, as would be expected based on results reported by Gallagher-Lepak et al. and Exter et al. (2009). It is very interesting to note that students viewed all seven learner–instructor interaction types as important and frequently occurring. Clearly, students value interaction with their instructor and perceive that it plays an important role in helping them feel a sense of belonging and trust within an online course. To answer the question of which interaction type offers the highest payoff for the instructor in terms of balance between effort and benefit, instructor modeling offers the greatest payoff. This sleeper interaction, of which many instructors have little awareness, offers a sizeable benefit in online learning. Students are evidently watching the communication behavior of instructors. They're learning when to interact, how to interact, and how to become part of the community of online learners by observing instructors and veteran online learners in their classes. Instructors would be wise to realize the power and influence of the ways in which they choose to respond to and guide students in their classes. Limitations of this study have to do with the nature of the data collection and the generalizability of the results. The surveys collected data based on student report of their perception of human interaction events within their online courses. While an effort was made to clearly communicate the nature of these events, there is always room for interpretation in social constructs of this kind. Students may have responded to survey items with a different type of event in mind than the researchers had intended. The sample was drawn from a group of students at one university in the South Central United States, so findings may not necessarily hold for students in other countries, institutions, and contexts. The low response rate, while typical of electronically distributed surveys, further limits generalizability. This study informs instructor practices in facilitating online SoC, but further research in this area would be beneficial to address a number of areas. Investigation of the types of interaction valued by students in varied education models also would be of interest; cohort models in which a group of students take multiple online courses together over an extended time period would be likely to experience changes in how and why they interact. Future studies of online SoC would benefit from including multiple universities to provide a more broad and diverse population. Use of qualitative methods including interviews with students would assist in the interpretation of quantitative results. Student open-ended responses might shed light on the reasons behind some interaction types emerging as low or high importance. Future studies also could consider other types of interaction such as learner–content or learner–interface, to determine their relative contribution to SoC. An instructor interested in facilitating SoC has many options for building opportunities for learner–instructor interaction into an online course. The instructor must be aware of the importance of his or her communication in showing students how to engage in behaviors that build community in an online course. Students observe instructor behavior and learn from it, taking cues in such areas as initiation of conversations, acceptance of opposing viewpoints, offering of encouragement, and use of tact in disagreements. Support of students through use of scaffolding of new skills, both technological and academic, is critical. The instructor should not expect students to pick up in three weeks technology skills that took the instructor two semesters to master. Students need to know they are not alone in their efforts to manage online learning, and instructors can encourage them by pointing out their successes and the normalcy of their experience. The instructor should maintain a presence in academic discussions, whether synchronous or asynchronous, and should facilitate discussions by offering comments, questions, and feedback to guide the discussion. Students value having multiple ways to communicate with the instructor. Students with varied communication styles and schedules will benefit from the instructor's flexibility in using synchronous, asynchronous, public, and private communication modes. Requiring participation and interaction in the course can contribute to building community. Busy students who are juggling competing demands will put their finite resources behind required activities. Instructors should determine students' experience level with online learning very early in the semester and establish frequent interaction with those who are new to this mode of learning, as they face the dual challenge of mastering content and a novel learning format. Support from the instructor can facilitate their comfort with and inclusion in the online environment. All in all, it is possible to create a welcoming and accepting course in an online environment by making available to students multiple ways to interact with the instructor. This purposeful planning of interaction facilitates SoC among the students and the instructor. Student satisfaction with online learning is enhanced by the interactions that make them feel that they belong to a community of learning. Berge, Z. L. (1995). The role of the online instructor/facilitator. Educational Technology, 35(1), 22-30. Drouin, M. A. (2008). The relationship between students' perceived sense of community and satisfaction, achievement, and retention in an online course. Quarterly Review of Distance Education, 9(3), 267-284. Exter, M. E., Korkmaz, N., Harlin, N. M., & Bichelmeyer, B. A. (2009). Sense of community within a fully online program: Perspectives of graduate students. Quarterly Review of Distance Education, 10(2), 177-194. Liu, X., Magjuka, R. J., Bonk, C. J., & Lee, S. (2007). Does sense of community matter? An examination of participants' perceptions of building learning communities in online courses. Quarterly Review of Distance Education, 8(1), 9-24. Ouzts, K. (2006). Sense of community in online courses. Quarterly Review of Distance Education, 7(3), 285-296. Palloff, R. M., & Pratt, K. (1999). Building learning communities in cyberspace. San Francisco, CA: Jossey-Bass. Pate, A., Smaldino, S., Mayall, H. J., & Luetkehans, L. (2009). Questioning the necessity of non-academic social discussion forums within online courses. Quarterly Review of Distance Education, 10(1), 1-8. Rogers, P. C., Graham, C. R., Rasmussen, R., Campbell, J. O., & Ure, D. M. (2003). Case 2: Blending face-to-face and distance learners in a synchronous class: Instructor and learner experiences. Quarterly Review of Distance Education, 4(3), 245-251. Rovai, A. P., & Baker, J. D. (2005). Gender differences in online learning: Sense of community, perceived learning, and interpersonal interactions. Quarterly Review of Distance Education, 6(1), 31-44. Swan, K. (2003). Learning effectiveness: What the research tells us. In J. Bourne & J. C. Moore (Eds. ), Elements of quality online education: Practice and direction (pp. 13-45). Needham, MA: The Sloan Consortium. The following statements relate to interactions between you and your instructor. Please indicate how often these interactions happened in this class. provide information on topics such as goals, expectations, ethics, information about the instructor? participate in and guide discussions? provide support and encouragement to students when needed? provide timely feedback on your performance? use multiple ways to communicate with you (such as phone, e-mail, Skype, course announcements)? interact in ways that showed you how to be part of an online classroom community (leading by example)? IMPORTANCE: How important were each of these interactions in contributing to your sense of community in this course? Approximately how many online courses have you taken prior to this course? Did your entire class meet in person in a physical classroom at least once during the semester?